Saratoga's Will Kraemer finished first overall to lead the Falcons to a team title at the Central Park Invitational in Santa Clara last week. All of the teams from the Santa Clara Valley Athletic League were in the field. 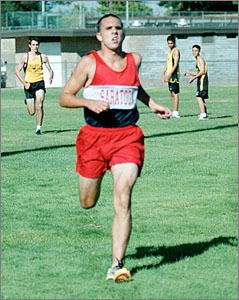 It's still pretty early in the 2001 high school cross country season, but you can't blame Saratoga coach Marshall Clark if he's wearing a bit of a smile. Clark certainly had good reason to smile last Thursday when all of the teams of the Santa Clara Valley Athletic League came together for the annual Central Park Invitational in Santa Clara--because the Falcons won it all in the boys varsity division. Individual champion Will Kraemer led the Falcons to the team title with a close victory over Karl Skucha of Wilcox. Kraemer covered the 2.3-mile course in 11:38.3 to finish exactly four seconds ahead of Skucha. The Falcons ran up a low 53 points to win the title. Wilcox was second with 70 points, and Milpitas was a close third with 71 points. David La finished seventh in 12:20.3 to support Kraemer's effort and Richard La was 10th in 12:35.6. Brett Stanger ended up 12th in 12:37.0 with Don Prolo 23rd in 12:55.9 to round out the top five for Saratoga. Lynbrook's Jeff Whitsett finished 14th in 12:43.0. Michelle Beritzhoff led the Los Gatos girls to a team fourth by romping to a sixth-place finish in 14:32.8. The Wildcats finished behind Gunn, Milpitas and St. Francis in the Santa Clara run. Freshman Alicia Follmar was eighth in 14:35.1 to pace the Saratoga girls to a team sixth. Junior Paula McNally nailed 23rd for the Falcons in 15:22.5 with sophomore Irene Fan 37th in 15:53.9, soph Josie Chan 43rd in 16:20.3 and junior Eevi Aura 51st in 16:40.6. Francine Lee of Lynbrook was 19th in 15:06.0. Austin Sardella of Fremont, Jacob Osborne of Saratoga and Tori Tyler of St. Francis were other Central Park winners. Sardella, a sophomore, ran to a win in the boys frosh-soph division, edging Monta Vista freshman Jason Yow by just over two seconds and Lynbrook soph Eugene Berson by six seconds. Sardella was first in the division in 12:43.1 with Yow second in 12:45.4 and Berson third in 12:49.9. Sardella led the Firebirds to the team title in the division with his individual victory. Yow's effort sparked Monta Vista to a team second. Alex Chen (seventh in 13:14.3), Howard Chang (12th in 13:39.5), Aaron Sommer (24th in 14:04.4) and Hadi Kho (36th in 14:30.0) rounded out the top five for the Matadors. Cupertino freshman Jason Yih finished 11th in 13:36.1 with Saratoga's Steven Surrette 20th in 13:59.6 and Conway Teng 21st in 14:01.1. Andrew Hao (25th), Jason Whitsett (27th) and Allen Change (28th) also ran well for Lynbrook. Osborne raced to a first-place finish in the boys junior varsity division, but Saratoga had to settle for a second-place finish behind Monta Vista in the team standings. Osborne won the race in 13:20.4 with Makato Endo of Monta Vista second in 14:00.3. James Kao (fourth), Wynn Chang (10th), Justin Lee (16th) and Aaron Nankin (23rd) joined Endo to make up the top five for the Matadors. Trevor Lovoi (fifth), Josh Smith (15th), Max Tam (17th) and Daniel Yang (25th) supported Osborne for the second-place Falcons. Lynbrook's James Lee was 31st. Tyler finished first to lead the St. Francis girls to a team title in the junior varsity division. Evelyn Oling was third in 16:01.4 to lead Monta Vista to a team second in the division. Katherine Chu was seventh, Yu Xuan Shi 15th, Joy Kim 18th and Veronica Peschansky 27th for the Mats. Saratoga's Saffai Parson was eighth overall with teammate Claire Tero 20th. Lynbrook's Soo Lee was 26th.